This species is often traded as A. hancockii, a name currently regarded synonymous with Platydoras hancockii. Type locality is Nauta, Peru, and the species may be endemic to the Peruvian Amazon region. Slow-moving and standing waters, including tributaries, creeks and swamps. The fish are usually found sheltering among roots or submerged vegetation, but leaves these retreats to feed in large schools by night. Minimum base dimensions of 60 cm x 30 cm are recommended. Keep it in a densely planted tank with an abundance of hiding places and dim lighting. A soft, sandy substrate is also preferable. 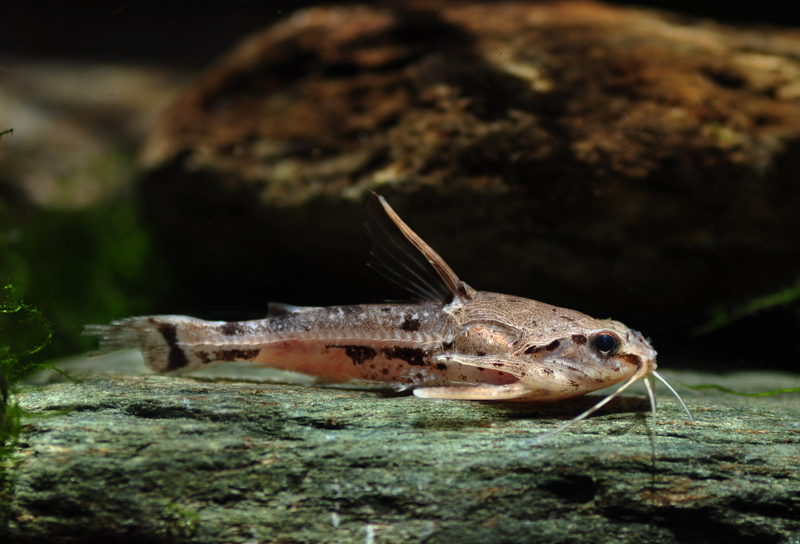 Proprietory catfish pellets, algae wafers and granular varieties will all be accepted, but live and frozen foods should also form a regular part of the diet. It’s a good idea to add food to the aquarium just before lights out as it mainly feeds during hours of darkness. Peaceful, but may eat very small fishes. Best kept in a South American biotope-style arrangement with medium-sized tetras, peaceful cichlids and catfishes such as other doradids, Corydoras spp. and Loricariids. It’s non-aggressive towards conspecifics and actually prefers the company of its own kind, so but a group of at least 3 of these if you can. The male apparently has a spotted underside while the female does not. Females also tend to develop a rounder body shape as they mature. Not yet achieved in captivity. Apparently, it builds a bubblenest among surface vegetation in nature, which is subsequently guarded by the male. This species was previously thought to be, and is often still sold as, A. hancockii, a name currently considered synonymous with Platydoras hancockii (Valenciennes 1840). 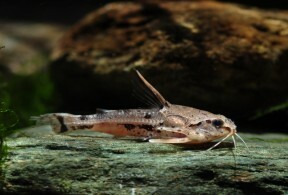 It’s also known by the vernacular names of blue-eyed catfish or Hancock’s doradid, and in many ways is an ideal beginners’ catfish, being hardy and tolerant of a wide range of water conditions. Its main drawback is its secretive nature and it will rarely be seen during daylight hours. If you want to see it more often, consider installing a red light above the tank. The fish cannot see red lightwaves, so if you switch this on at night you should be able to observe it foraging for food. The ‘talking catfish’ moniker is derived from the fishes ability to produce sounds when communicating with conspecifics or threatened. It can produce these in 2 ways. The first is by locking the pectoral fins into their sockets to an extent. The fish can then grind the spines on the pectorals against the socket, producing a ‘buzzing’ sound. The second is by rapidly contracting and relaxing a muscle that’s attached to the back of the skull at one end and the front of the swim bladder at the other. This causes the swimbladder to resonate and produces a slightly deeper sound. The noises are clearly audible and can sometimes be heard through the aquarium glass, or when the fish is netted. A word on netting these cats; the spines on the body and fins can easily become entangled in the mesh of aquarium nets, so take care if you need to move it for any reason. The sharp pectoral spines can also cause an eye-watering wound if you happen to be impaled by them.